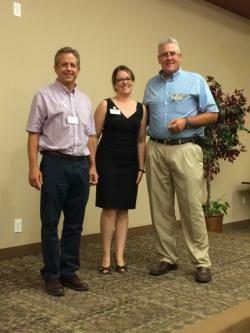 Susan Sternitzke of Limelight Creative Group was our guest speaker during this afternoon's meeting. 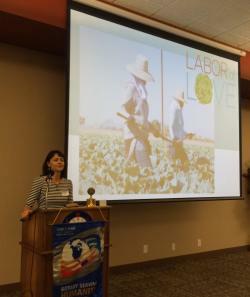 Susan explained the Labor of Love Program sponsored by local agricultural growers and harvesters to celebrate the hard working and dedicated farm workers. The program is designed to show the community's appreciation through various surprise visits with offerings of gifts, food, blankets and shopping sprees. It also gives the farm workers an opportunity to tell their story. For ...more information about the program, please visit www.laborofloveyuma.com. If you are interested in getting involved or donating items, please contact Susan at susan@limelightcreativegroup.com. During this afternoon's meeting, Ray Face recognized Jeff Kammann for his Acts of Good and contributions to the community through his work as a Rotarian and Caballero, and shared his sentiments that his Grandfather would be so proud. Congrats Jeff, it is an honor to serve with you!! Asst. 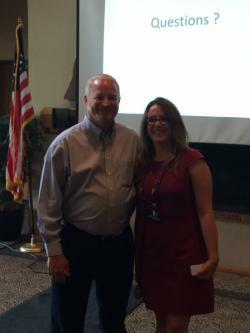 District Governor, Mike Lundy introduced Yuma Rotary's guest speaker, District Governor, Sheryl Christensen. Sheryl shared her passion to combat polio began when her childhood friend was diagnosed with it. Because of Rotary's dedication to eradication, there are only 24 known cases throughout the world! 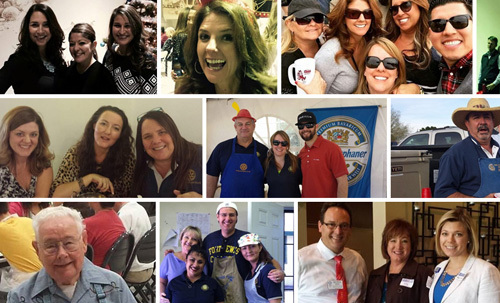 Sheryl announced Rotary has been ranked the #4 charitable foundation throughout the world and commends the efforts of Rotarians throughout District 5500 for their dedic...ation to local and international projects. 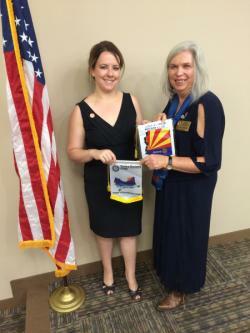 Sheryl shared her goals as District Governor are to increase Rotary membership and become involved with the Rotary Rose Parade Float and Rotary Vocational Friends of Arizona program. In closing, Sheryl asked Yuma Rotarians to participate in the Rotary Conference in Atlanta from June 10-14 and the District Conference held in Yuma April 28-30 at the Pivot Point. President Melissa presented both Page Misenheimer and Diane Umphress with pins recognizing their contributions towards Yuma Rotary and their dedication to our community. Melissa also presented Diane with a check towards the replacement of lights stolen from Amberly's Place. During this afternoon's meeting, Jon Mathues presented Ray Face with the 100 Acts of Good challenge coin for his efforts and support of many agencies within the Yuma community. Congratulations Ray!! Lisa Ball from Special Olympics Arizona was our guest speaker this afternoon and shared information about the various programs that help build confidence, reduces bullying, brings a sense of inclusion and acceptance for special needs children within Yuma County. 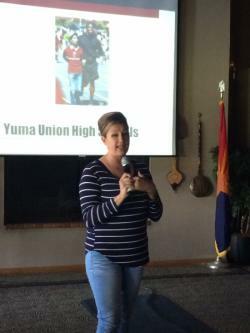 Lisa praised all of Yuma County's school districts for getting involved in Unified Sports and shared information about their upcoming Breakfast of Champions on October 12th. To learn more about getting involved in the programs, leadership council, committees and fundraising efforts, please give Lisa a call at 928-210-8862. 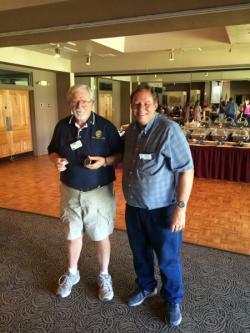 During this afternoon's Yuma Rotary meeting, Dave Hossler presented a coin and Acts of Good pin to Gary Davis for his continued dedication to serving our community. Congrats Gary! 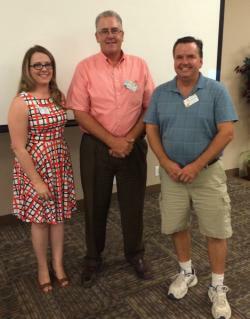 Welcome to Yuma Rotary Erick Solis! 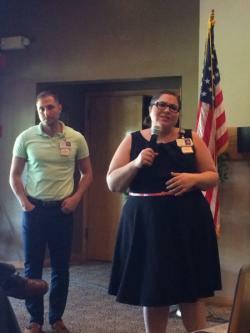 President Melissa and members of Yuma Rotary welcomed Erick Solis as a new member to our club this afternoon. Erick is a graduate of Kofa High School and owns a roofing company here in town. Margaret Geis had the pleasure of pinning Erick today! Welcome Erick and thank you Brenda Howell for bringing a real gem to the club!! President Melissa recognized Eve for her Acts of Good and constant support of Yuma Rotary and her dedication to volunteering at Amberly's Place! Congrats Eve! This afternoon Denise McGregor recognized Dave Hossler for his many contributions and thousands of Acts of Good throughout Rotary, our community and his efforts to help start up many clubs in town. Dave has helped bring in over 212 people to these groups and has contributed towards 50 Paul Harris awards. Thank you Dave, we love you!! Yuma Rotary President Melissa and Cibola High School Counselor Mary Lynn Coleman highlighted Diego Salgado as our Student of the Month for his exceptional efforts towards his studies. Diego took a moment to thank God and his parents for their never ending support. Diego plans to attend Stanford to study mechanical engineering. Congrats and we are so proud of you!! Many thanks to City Administrator, Greg Wilkinson for speaking to our group about the benefits of passing Prop 407 on the General Election ballot November 8th. A YES vote allows for an increase in sales tax of $0.03 on every $10.00. What we get in return is a freeze on City property taxes for three years, and the approximate $6M collected will be distributed towards subdivision asphalt replacement and additional staff and equipment for YPD and YFD. It's an important vote so please feel free to share and help spread the word! 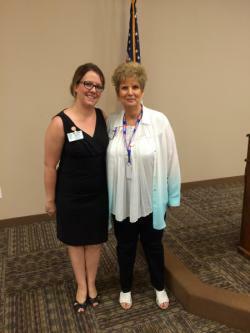 Yuma Rotary welcomes Anna Martinez and Pauline Villa! It was an honor for President Melissa to induct Anna Martinez and Pauline Villa into Yuma Rotary during this afternoon's meeting. Both ladies were nominated by Flora Llamas (woo hoo!) and are excited to be involved in the great projects and events our club supports! Welcome ladies!! This afternoon President Melissa recognized Lori Arney and Barbara Hengl for their Acts of Good through tremendous support of the Yuma Rotary. Thank you for all you do and Congrats!!! Congrats to Denise McGregor for being recognized by Betty Denise as a 100 Acts of Good recipient for her project Tails of Joy which has been adopted by YRMC. We appreciate guest speakers Mario Zappitelli and Diana Maldonado from YRMC who explained the hospital continuously assesses the community's health needs and participants in various health fairs throughout the County to promote the services the provide. Mario shared information about the Silver Care program and from the heart said that Yuma is one of the most caring communities he's had the pleasure to work in! Yuma Rotary's Student of the Month is Cibola High School's Rosa Vasquez. Rosa was selected because of her dedication to student council and a long list of other school activities and aspires to attend the University of Arizona to become a Pediatric Surgeon. 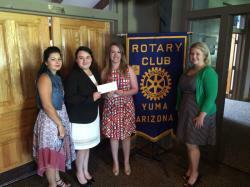 Yuma Rotary provided a check for $100 to go towards her studies. This afternoon President Melissa presented Matt Molenar with a 100 Acts of Good pin in recognition of his efforts to promote literacy in his neighborhood by putting a Lending Library in front of his house. How cool is that?!?! 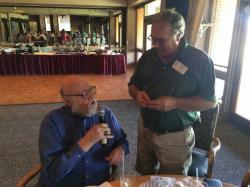 Doug Richey acknowledged Jim Conlee this afternoon and gave him a challenge coin for his many Acts of Good and being the 'voice' of Yuma Rotary. We love you Jim! !